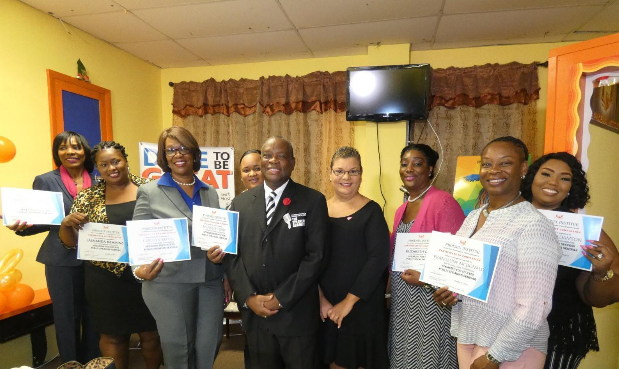 Master Motivator Spence Finlayson Speakers Academy recently held its graduation ceremony in Nassau at the Academy on Prince Charles Drive. The Founder & CEO , Spence Finlayson, International Conference Speaker , said that 8 ladies graduated from the 6 weeks Public Speaking Training Program. He went on to remind the graduates that there about the top ten fears ; 1. Fear of flying 2. Fear of Public Speaking 3. Fear of heights 4. Fear of intimacy 5. Fear of failure 6. Fear of Success 7. Fear of the dark 8. Fear of Rejection 9.Fear of death 10.Fear of God. The graduates included : Eva Joyce , Carolyn Bethel, Shenique Ford, Tiffany Williamson, Michelene Pierre, Lashanda Rahming, and Elizabeth Clyde. Finlayson, has given 5,000 speeches and presentations over 30 years in over 26 countries. He is a much sought after conference speaker and corporate trainer . The commencement speaker was former CEO of The Bahamas Telecommunications Company , Mr Leon R. Williams , who did a stellar job. His presentation was riveting , humorous , and instructional. The Mission of Master Motivator Spence Finlayson Speakers Academy is to guide ands support speakers so they feel confident and masterful at each presentation. Its vision is to become the international trusted experts in developing committed professionals , who want to understand and master presentation skills. Spence Finlayson said in closing the ceremony, ‘if you can speak, you can influence , if you can influence , you can change lives.